In Record of a Tenement Gentleman, Ozu yet again presents a deceptively simple story in the manner typical of the most powerful of his films. The seeming sentimentality of a lost child slowly warming a hardhearted woman is deflected by the child’s grubbiness and stoicism, the lack of any cute exchanges, and Ozu’s well-known avoidance of close-ups or scenes of emotional outpouring. Critics and reviewers who describe the film as a light comedy are correct, but only on one level. Ozu’s treatment of his scenario is so unobtrusively deft we may not see at first how deeply the effects of World War II are impressed upon every shot, setting, and character of the film. When we do, Record of a Tenement Gentleman becomes less a singular story about the unlocking of an elderly woman’s heart than a populist Japanese postwar blues delivered in that comic and bittersweet lyric style that is distinctly Ozu’s. Though the prolific Ozu directed 54 films between 1927 and 1962, Record of a Tenement Gentleman was his first film after a production drought of five years – the longest gap of his career, attributable to the destabilisation wreaked on Japan by the war. He shot the film and released it in the immediate postwar “reconstruction” era. From June 1943, Ozu was stowed safely away from the larger battles of the war, staying in Singapore to at least Japan’s surrender in August 1945. While there, he pursued his fondness for American films, screening titles that had been captured by the Japanese army (though it’s notoriously difficult to trace much influence over his own unique style). When Ozu returned from Singapore, he found out that his mother, with whom he’d lived all his life, had been required to move from Tokyo to Noda where his sister lived. When he too moved there to be with them on his return, this marked his exodus from Tokyo, a city in which he never lived again. So the decision to set his film in the shitamachi (the “Low City” or downtown area) section of Tokyo amid its lively plebeian inhabitants conveys a truly personal sense of loss – like an elegy for the vitality of his old home. This is compounded by the political choice of setting the film in what was actually a razed and flattened area. 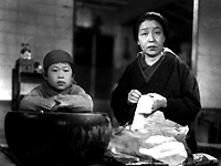 Almost the entire film was shot, of necessity, in the studio because the community Ozu portrayed was effectively extinct. In Record of a Tenement Gentleman, the master of the gendai-geki – the contemporary drama – ennobles a milieu that is not as middle-class as usual in his work. All of our characters are in some way itinerant, lost, or have been split from something dear to them. Tané (Choko Iida) is a widow, perhaps even a recent war widow, with an understandably hard heart. Her kitchen with its quietly simmering pots, wheat grinder, and vases of utensils becomes a focal point around which the film flows. The lost child, Kohei (Hohi Aoki), has been separated from his father (Eitaro Ozawa), a roving carpenter without a home And Tané’s two neighbors, Tashiro (Chishu Ryu) and Tamekichi (Reikichi Kawamura) have led transient, grasping lives. Once an amusement show story-singer, Tashiro now predicts fortunes. A struggling actor who opens the film rehearsing a speech about a marriage break-up, Tamekichi also practices calligraphy and is somewhat estranged from his frivolous daughter Yuki (Hideko Mimura), who doesn’t understand the contemporary recession. Everyone in the neighborhood, including a humble, smiling township leader and Kiku (Mitsuko Yoshikawa), the geisha house mistress, ekes out a living by relying on the black market and on each other. So the family unit at the center of this film is a makeshift one, not related by blood but by proximity and common struggle. Perhaps that’s why among Ozu’s most moving sequences is the one in this film of an evening neighbourhood meeting, at which the adults persuade Tashiro to sing an old story. Embarrassed, he eventually relates a historical legend about the love that a naval ensign offers to an army general’s daughter. The film stops entirely for his modest, assured performance, which lifts the spirits like almost nothing else in Ozu’s oeuvre. Many scholars have pointed out the importance of weather in Ozu’s films; here the perpetual breeze drifting through these landscapes of bombed-out Tokyo is hard to ignore. Whether indicated by a soiled mattress swaying on its drying post, litter scattering across a rubble-strewn street, or venting steam dissipating into the clouds over the ramshackle town, a “current” perpetually sweeps gently through and over Tokyo. Something is always moving and changing in even the stillest tableau. From a panorama of a desolate Tokyo neighbourhood reduced to rubble by war, the film moves away from its main characters into a profoundly affecting coda set in Tokyo’s Ueno Park. This survey of nameless homeless children hanging around the lawns offers an strongly pacifist statement about the effects of war, while also featuring two shots of the famous bronze statute of the legendary Takamori Saigo. Though the facts surrounding Saigo are hazy and often contradictory, as a legendary heroic figure he represents to many Japanese, especially those in the south, one of the final true leaders of the samurai class, that distinctly Japanese caste who would rather die than give up honour. Saigo reportedly ordered a comrade to slice off his head to save him from the agony of admitting defeat. In 1868, Saigo led a victorious military campaign over the shogun’s supporters, a key moment in the painful transition away from the feudal system. He aided the establishment of the imperial Meiji government, but then rebelled against it by retiring in 1873, protesting planned military actions against North Korea (though he did favour its annexation). Saigo’s small cluster of supporters were forced into rebellion when the Meiji government eliminated their rice stipends. Facing starvation, the people, greatly outnumbered, had to take arms, and attempted a military coup. Under attack, the government was now able to butcher the rebels claiming self-defence. And that’s what they did. Though Saigo is memorialised in military garb in a statue at Kagoshima’s Central Park, at Ueno Park he’s depicted in a kimono walking his hunting dog, a man of the people in a public park. As Supreme Commander for the Allied Powers during the occupation, General Douglas MacArthur initially oversaw the destruction of all Japanese military equipment, the “trials” of thousands of official war criminals, hundreds of executions, and the drafting of the “MacArthur Constitution” which replaced the 1889 Constitution drafted by the Meiji government. MacArthur also tried to order the removal of the Saigo statue from the park on the grounds of its nationalistic associations. The Japanese people refused to allow it to be taken away. When we watch the final shots of this statue in that context, they evoke a profoundly Japanese solidarity, indicating a country not truly defeated, picking up the pieces, during an occupation not even shown on screen. Michael Price is a writer living in Seoul, South Korea.